It’s unlikely that modern Israeli cooking will ever bump New Nordic or Asian Hipster from their positions atop the list of Zeitgeist-y New York cuisines. But recently, a new wave of Israeli food has made inroads, beginning, as these things often do, with oversubscribed pop-ups: The Kubbeh Project occupied Zucker Bakery for three weeks in March, celebrating Iraqi-Jewish dumpling soups, and then Michael Solomonov, the foie-gras-kebab-grilling chef of Philadelphia’s Zahav, had to add a second seating (at 1 a.m.!) for his Momofuku Ssäm Bar binge. In further hipster-foodie news, two Israeli-expat stands landed at the Brooklyn Flea (Plantí’s artful hummus plates, NYShuk’s hand-rolled couscous). This year has also seen the arrival of Tel Aviv baker Uri Scheft, whose eclectic output at Union Square’s Breads Bakery (18 E. 16th St., nr. Union Sq. W.; 212-633-2253) ranges from everything-seeded challah to chocolate-coated alfajores, the Argentine cookie that’s like the cupcake of Israel, and the debut of basil-tinged “crazy baba” at Zizi Limona (129 Havemeyer St., nr. S. 1st St., Williamsburg; 347-763-1463), a free-spirited Brooklyn restaurant where chef Nir Mesika stocks his larder with not only date honey and za’atar but curry power and fish sauce. This sort of no-boundaries fusion is to be expected from a melting-pot nation like Israel, whose citizens hail from every corner of the globe—not unlike New York, which provides fertile ground for even more crossover cooking. And so we have the tomatillo-sauced “green shakshuka” at Jack’s Wife Freda (224 Lafayette St., nr. Spring St.; 212-510-8550); Taboonette’s (30 E. 13th St., nr. University Pl. ; 212-510-7881) pita pockets subversively stuffed with pulled pork; and corn empanadas at Balaboosta (214 Mulberry St., nr. Spring St.; 212-966-7366), whose chef-owner Einat Admony promises her next modern Israeli restaurant, Bar Bolonat (611 Hudson St., at 12th St.; no phone yet), will be even more irreverent. 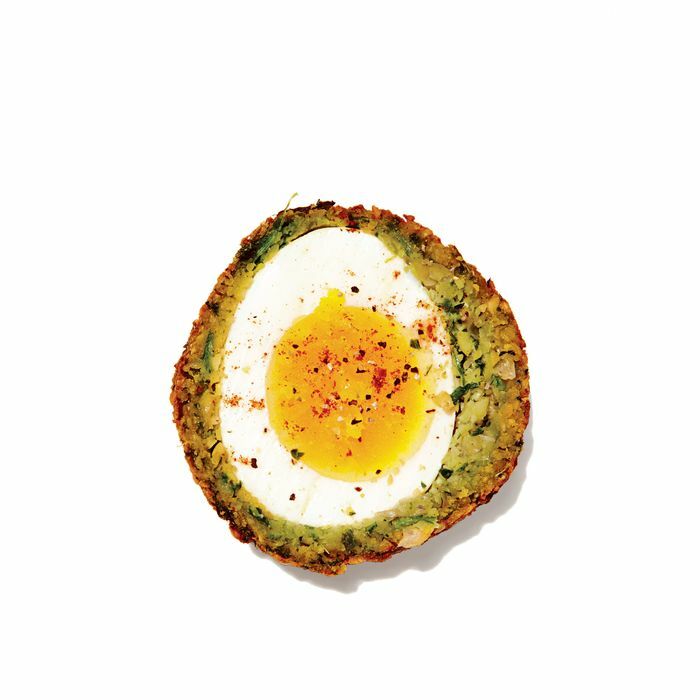 There may be no better symbol of the new wave, though, than the Israeli Scotch egg at the Lower East Side bar Eastwood (200 Clinton St., at E. Broadway; 917-284-4514), where partner Sivan Harlap conceived of the snack as a clever hybrid of her Israeli heritage and her husband’s Scottish one. Coated in falafel, not sausage, and served with tahini, it’s immigrant food at its culture-bridging best. *This article originally appeared in the May 27, 2013 issue of New York Magazine.